A few mornings ago, I imagined that my wild yeast starter was all ready to make bread. 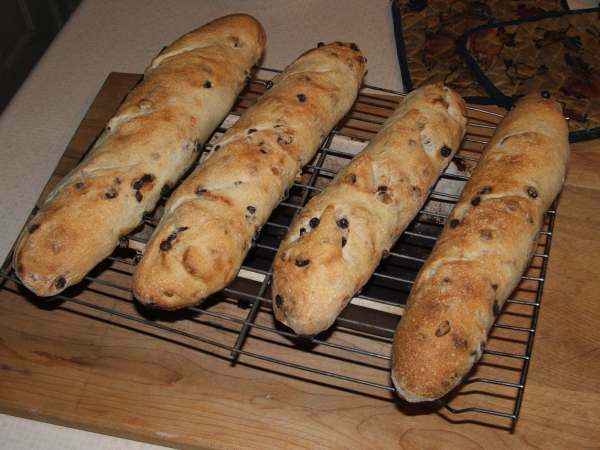 I announced I would make focaccia with it to go with that evening's dinner of puy lentils and sausage. Silly me. I should have known this would be a mistake. My failures with my wild yeast are legion this winter. The focaccia dough failed entirely to rise. Not even a glimmer of a bubble. After several hours. So I stuck the slumping lump of dough in the fridge and made another announcement: I would make chapatis with wild yeast (ha) dough the next day, because they're made without yeast anyway. What a brilliant save!! 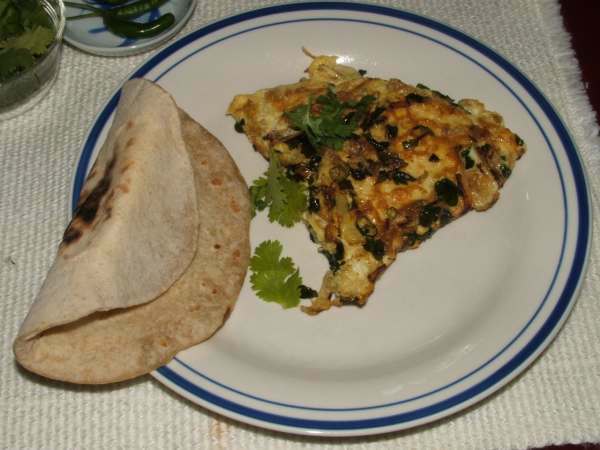 The chapatis tasted faintly sour but they were absolutely wonderful. Especially when you consider that the dough might have been baked into a spectacularly terrible focaccia. It has been driving me crazy to just throw away the leftovers after feeding our wild yeast starter. Especially as it seems to be in perfectly good condition. I know it's just a couple of tablespoons of flour but still it just seems wrong even to compost it. 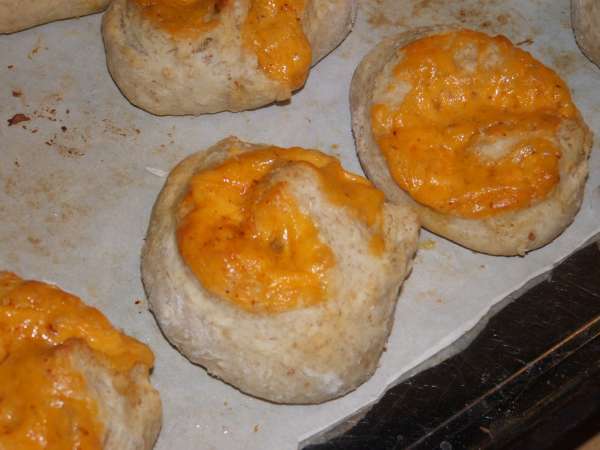 So now, every time I feed the starter, I have been adding whatever is left over to biscuits or muffins or even bread that is made with commercial yeast. There are some hazards to not measuring... perhaps I added a tiny bit too much cheese. 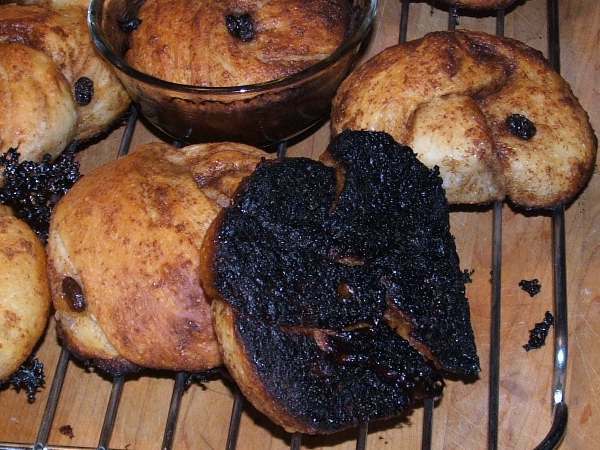 See how it exploded out of the pinwheels in the baking. 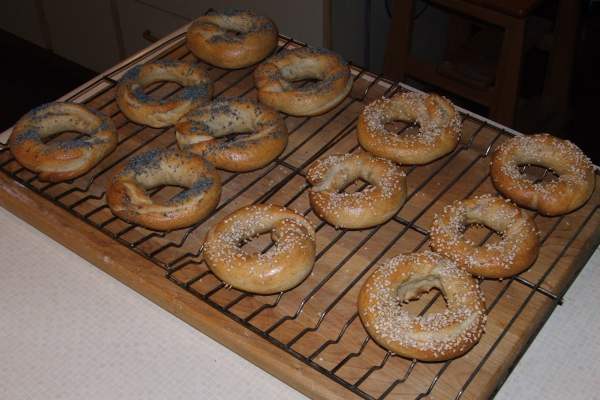 After admiring Susan's (Wild Yeast) bagels several times, I decided to copy her and use my wild yeast starter too. And how did the bagels taste? Well, I liked them! I loved them on their own and also with goat's cheese and red currant jelly. And coffee. Of course. 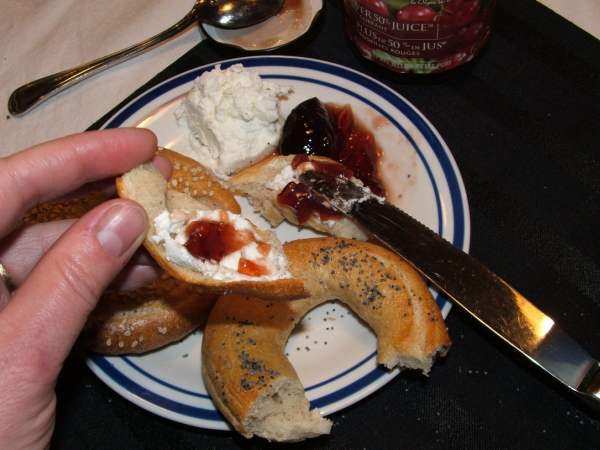 The bagels are firm and chewy on the outside and soft and chewy on the inside - just the way that bagels should be (or at least I think so....) Another taster said that there was too much taste of sourdough and not enough of malt. I confess that I didn't really taste the sourness but am certainly willing to tone it down. Any ideas on how to go about doing that? Can I just add more malt to the dough? This must be bagel season! 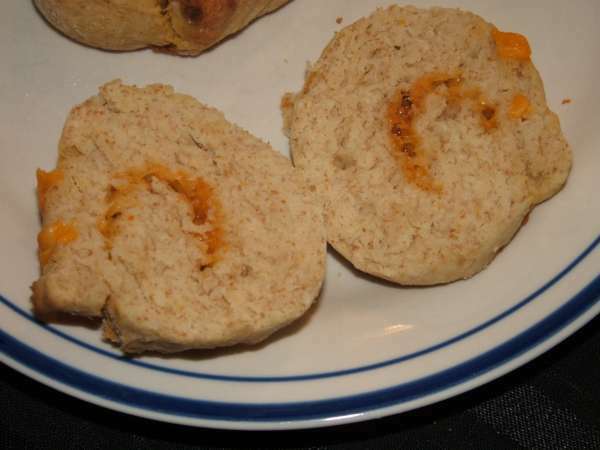 I see that FloydM has just made bagels too. I can't decide what I like more about this bread. The aroma of it baking? The currants! The fennel! The slight hint of sourdough flavour from the wild yeast! Sliced warm with roccolo cheese? Toasted with butter? It's impossible to pin it down. All I know is that we both love it. 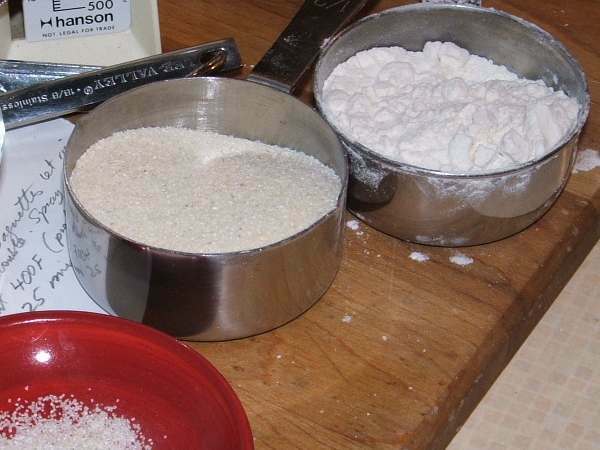 We buy our semolina in Indiatown - semolina is called "suji". 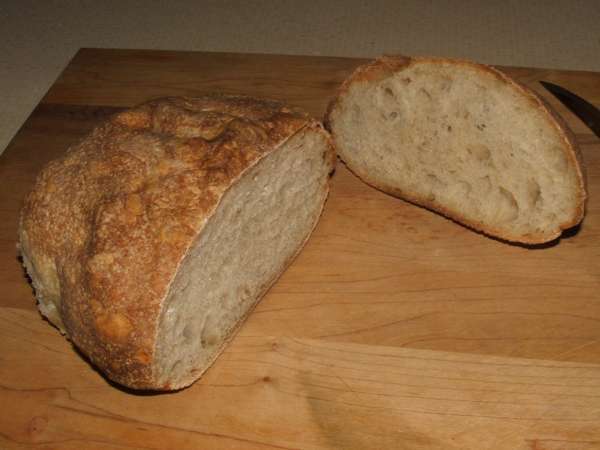 Even after about 10 minutes of kneading, I decided that the bread dough would probably always be a bit grainy feeling. I added the currants and pinenuts and amazingly, as I was working the dough to distribute the currants evenly, the dough suddenly became smooth and silky! I really couldn't be more thrilled about the bread. I have only one complaint. It takes no time for a loaf to disappear! Lately, I have been having a devil of a time judging whether the dough has risen enough. And I have been allowing it to over-rise. 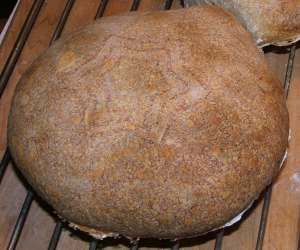 The over-risen dough produces flat as pancake loaves that taste good but don't look all that great. 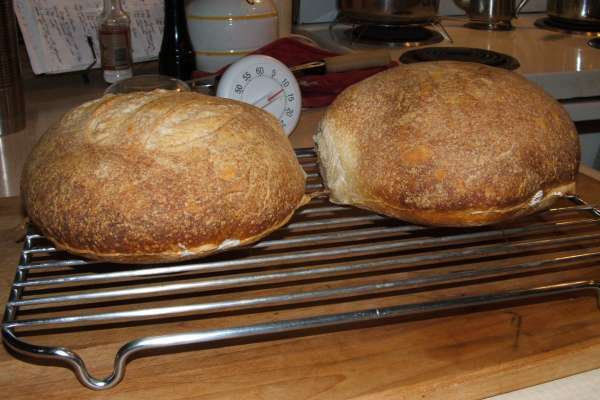 But finally, after weeks of trying, there was oven spring and the loaves are round rather than flat. Yay! I like to balance cookie cutter(s) on top of the just shaped bread to etch a design in top of the loaf. For this loaf, I used 3 star shaped cutters. (Remove the cookie cutters just before baking the bread.) I really like the way it looks! It's not quite as spectacular as the ridges that people get by proofing their bread upside down in baskets but it doesn't require nearly the nerve. 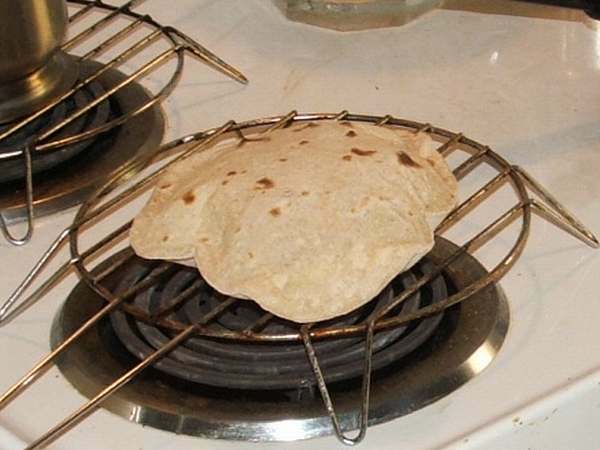 One doesn't have to flip risen bread out onto a peel with this designing technique.